As we continue in our story of Gideon as a foreshadowing type of Christ, we find that the Angel of YHVH was prepared to offer Israel’s then-future deliverer wondrous signs to assure him of victory over Israel’s oppressive enemies, the Midianites. Gideon, naturally, had a difficult time with the Divine revelation of him bringing peace and security to the Hebrew tribes, for his family was poor and he counted himself “least in my father’s house.” To him it seemed like an odd thing for God not to choose someone wealthy and strong, from a prominent family in an influential city. Little did he know that God was orchestrating his life as part of a pattern from which would someday arise the Jewish Messiah, or that God’s strength is perfected in weakness (see 2 Cor. 12:9), when our rebellious spirits are humbled enough to hear and obey His Holy Spirit. Gideon’s plight and defeating the might of the stronger Midianites was an early version of the David and Goliath story, and both plights were preludes of what would come with the humble beginning and ultimate victory of Jesus Christ. One thing that Gideon did comprehend is that victory could indeed come by the grace of the Divine, which was fine with him as long as the Messenger of God proved to be who He claimed to be, with signs and wonders. The harvester of Abiezrite might be of the least and the weak, but he had faith that the real God YHVH was strong enough to win in any circumstance. And, for readers who are beginning to see these things in prophetic parallels, Israel will likewise be delivered from stronger enemies when they accept the signs and wonders of Christ and receive grace through the New Covenant promised them. Grace was not there when the Romans destroyed Jerusalem, but now come the days of grace with turned back hearts. Gideon could hardly believe his own ears about God’s deliverance of Israel, much like many people today when hearing the Gospel of Salvation; yet he was willing to provide a sacrifice to the Lord YHVH and do the work to find out. As for grace and deliverance, note that the foreshadowing indicates that the future Deliverer (Mashiach) had to leave the spiritual harvesting and come back to it- something we Christians call “the second coming” or the “second advent.” The same can be said for millions of Jews returning to the Holy Land and the work of God after their long Diaspora: They had to leave and come back to see if their HaShem was still there. Now they must only offer an acceptable Sacrifice. For some readers, these biblical parallels may be but coincidences thought up by the mind of the scribe, but I assure you who have doubts that the Holy Spirit makes the correlations, and God can do so with every biblical story line upon line and precept upon precept. God’s grace for me is that I am able to summarize some of these correlative passages, for, as the apostles discerned, all the books in the world cannot contain the works of God through Messiah (see John 21:25). It is enough for me to write these articles and make some of the stories plain, because truly the time is short for Christ to return. What I offer in these articles is but a sample in comparison to the everlasting feast that the Word offers those who learn to discern God’s paradigm of parables and supporting evidences. For those who recall the story of Samson’s father seeking a sign to confirm God’s message of deliverance through the birth of his son, miraculous fire was given by the messenger of the Lord YHVH (see Samson’s Riddle articles). And, as written in a previous article on Elijah, fire from Heaven was also given as a sign to turn back the hearts of Israel to their Elohim YHVH, whereby the people came to believe and destroyed the false prophets of Baal and other foreign deities erected by wicked Jezebel. We find many sacrificial offers to God before the Levite priesthood, such as with Abraham offering a fatted calf when the Angel of YHVH and His two witnesses visited him- promising the birth of a son and the destruction of wicked cities (see article on Sodom and Gomorrah). Priests (kohanim) were later instructed by God, through Moses, to nationalize a sacrificial system to perform their moedim with “sin offerings.” Goats, as with Gideon’s sacrificial gift, symbolized sin being consumed by the fire of the Holy Spirit, and, although after the Law was given in connection to the Tabernacle and appointed priests, it demonstrates that God can work with whomever He pleases. After all, the main idea of Torah is not the priesthood: The theme of Scripture is God utilizing the Hebrew culture available for forming a system to profess His works through Messiah. Everything was meant to foreshadow a much longer age and panoramic plan of redemption. I explained in the first article on Gideon that he was the son of Joash the Abiezrite, which means God-given and Father of help. Hence, God accepted the goat sacrifices because they foreshadowed God’s greater Gift to us: the sacrifice of the Suffering Servant Messiah. As Abraham, the “father of nations,” told his promised son Isaac, God would provide His own sacrifice. The promised Son became a sin offering for us (cf. Isa. 53:6-9; 2 Cor. 5:18-21). He died so that we could have life, even as Elohim YHVH comforted Gideon after the accepted sacrifice, saying, “Peace [shalom] be unto you. Fear not, you shall not die.” Christ became our peace offering, sin offering, and transgression offering for reconciliation with God. As for the rock upon which the sacrifice was accepted, we know by numerous Scriptures, as cited in previous articles, that God is our great Rock of refuge (see Deut. 32), and Messiah comes from God like a Rock cut from the Mountain, by the work of the Divine and not by the hands of mankind (see Dan. 2:44-45). He is the Rock upon whom Moses, the priests, and the prophets built the foundation of Old Testament Judaism, and upon Him Peter and the apostles laid the foundation of the Christian Ekklesia. God tests all things built upon the Rock by Ruach haKodesh fire (cf. Matt. 16:18; Luke 6:48; 20:17-18; 1 Cor. 3:11-17). The Lawgiver struck the rock to grant waters of salvation to the Israelites in the wilderness, but every rebel who refuses the water given by our Rock will not leave the wilderness of the world to enter God’s Great Sabbath Kingdom. Two witnesses will soon send out a last call with prophecies, with the fire of the Holy Spirit coming from their mouths, then our Rock of Refuge will come to deliver Zion and the elect of God (see Rom. 11). The unleavened bread that was accepted by God with the goat offering alludes to the seven-day Feast of Unleavened Bread, and the feast, from the 15th-21st of Aviv (the first month of the Sacred Calendar), points us to the work of God in refining His people, removing the leaven of self-exaltation and pride against the Creator. 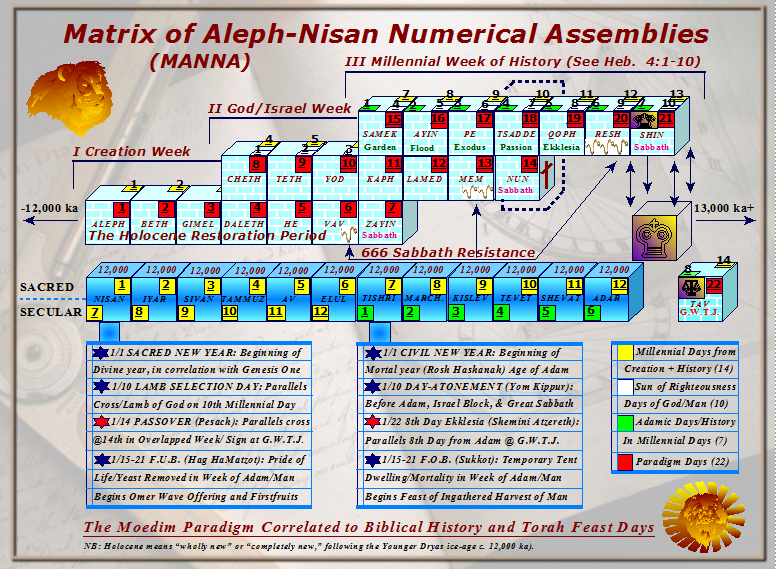 It covers the seven millennial days from Adam to the end of the Great Sabbath of Messiah, as revealed in the Moedim Paradigm. After the coming Sabbath will come the Eighth Day Assembly of God (Shemini Atzereth), which is also known as the Great White Throne Judgment- 22nd millennial day in the template of God. God’s message to Gideon was that he would soon battle the Midianites and have a great victory, but after the Lord YHVH accepted Gideon’s gift/sacrifice, the then-future deliverer of Israel created an altar (to commemorate the appearance of the Angel of God) and called it the “Peace of YHVH.” This is a message that is relevant to our own time and the coming Apocalypse: Israel and the faithful elect around the world want peace, and look to the peace of the coming millennial Sabbath, but we know that war over the Promised Land comes first. The Deliver must come out of Zion to defeat oppressors and persecutor of His people. The sacrificial Altar of the Temple of God, for performing the moedim feasts that were Divinely designed to profess and commemorate the acceptable sacrifice of Messiah (like Gideon’s altar), will be built before the Antichrist and his united legions are defeated. Indeed, the preparations are already underway by the Temple Institute and those who have desired to do God’s will since Jews of the Diaspora began to return. However, there is another altar for what Apostle Peter (Kefa) called the “Temple of Living Stones,” that must be completed before victory ensues: the altar of hearts for Christ’s sacrifice, for we are the Temples of the Holy Spirit when our hearts our turned back to God. As we continue our story of Gideon as a type of Messiah- as a judge and deliverer of Israel- let the reader keep in mind that all these parallels are given for us at the end of the age to prepare for the coming seven years of the Apocalypse. While the wicked of the world remain ignorant to the coming judgment of God and amazing truths in prophetic Scriptures that profess Messiah, the faithful will come out of darkness to the light of His enlightenment. Like Gideon, we are instructed and will have the ultimate victory over all false gods and those who love lies and hate the Truth. As most Bible-believers already know, God had reasons for giving detailed instructions that, with a superficial reading, seem somewhat repetitious and unnecessary. Why not simply instruct Gideon to take his father’s young bull and smash Baal and Asherah, then build an altar and use the wood and bull to present an offering? After all, we already know certain things, like the fact that the young bull must have been sired by an older bull. Yet it is with such extra details that God causes deeper contemplation and enables the prophetic mind to correlate shadows of old to future fulfillment in Christ. First, we know that the sacrifice was chosen by God and not checked for blemishes and chosen by the Levitical priests. This looked to the fact that God would choose Christ as a sacrifice for sins. Sacrificial bulls were for sin offerings (see Lev. 1:1-7), and their blood was sprinkled on the Altar of Sacrifice near the door of the Tabernacle of Meeting. Young bulls were also accepted as peace offerings from the people to God (see Num. 13:8). The priests would set the wood in specific order before burning the sacrifice, which looked to the fact that Christ was foreordained to die on the cross in the orderly works of God. Yet there is another sacrifice during the seven years of the Apocalypse, for the martyred saints (killed for teaching the Word of God). In Revelation we see them under the Altar in Heaven crying out, asking, “How long, O Lord, holy and true, will you not judge and avenge our blood on those who dwell on the earth?” (See Rev. 6:10.) In response, they were given righteous robes and told to rest for a season until the number of martyrs on Earth is fulfilled. Then God would take His vengeance on the wicked. Hence, in Scripture (the Torah books) we find that the priests would sprinkle the blood seven times before the LORD, in front of the veil of the Sanctuary; then they would place some of the blood on the Altar of Incense before pouring out the remaining portion at the base of the Altar of Sacrifice (see Lev. 4:6-7). For seven years there will be martyrs like never before, but during the sixth year/seal many will heed God’s instructions and be sealed. The seventh year if the Year of Recompense, when God renders justice for His people. The blood was placed on the Altar of Incense and poured out at the base of the Altar of Sacrifice because it represents the sacrifice of the people of God and their prayers ascending like incense (see Rev. 8:1-4). What remained of the bull’s carcase was burned on wood at a sanctified place outside of the Hebrew camp, where ashes were poured out, and this seems to symbolize those who are killed while seeking the coming Kingdom and taking up their crosses. It may also hint at the sacrifice of the wicked at the Battle of Armageddon, but this I cannot ascertain. It should also be noted that bull sacrifices served an important role in making atonement for the Levitical priests. For seven days the sons of Aaron would offer a bull sacrifice and sprinkle the blood. Hence, we are not only considering the last seven years of the age, but God makes priests for the coming Kingdom out of all seven millennium since Adam. 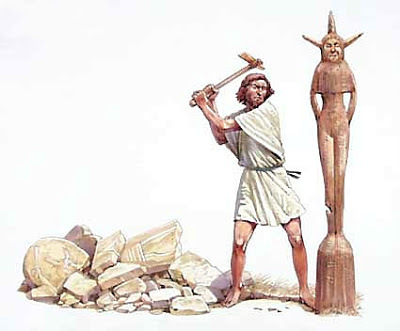 If, as I believe, the destruction of Baal’s altar foreshadows Allah and God’s vengeance upon Islam, we should ask what the pantheon of Asherah, as a grove of idols, represents for the end of the age. In my mind, Babylon the Great is the only answer with sure, historical links. Babylon will be cast down as a burning mountain, cast into the sea, during the same time- the Apocalypse- that the Lord shatters Islam for His people Israel. The mother/goddess Asherah, the “Queen of Heaven” (cf. Jer. 7:18; 44:17-25), was the consort of the Sumerian (early Babylonian) Anu: their “god of heaven.” Like Babylon near the sea in Revelation, she was called “Lady Athirat of the Sea.” There are also regional links to Astarte, Ashtoreh, and the Babylonian Ishtar. Also interesting, Asherah supposedly had 70 priestly sons, which seems to parallel the seventy special priests of the Roman Catholic Church- a sort of false Sanhedrin. As we continue in the plight of Gideon, consider how the destruction of Asherah and Baal came unexpectedly in the night, which correlates to the coming, sudden destruction of Babylon in Revelation. This may hint to Christ coming as a thief in the night against His enemies, but we should note that Gideon had to destroy his own father’s pagan altar. This may be a sign that God is pointing us to the “Destroyer” of Revelation– to wreck some of his father Satan’s works. Remember, there is often duality for fulfillment in prophetic shadows, so Gideon may symbolize God working through Messiah to save Israel as well as God utilizing other destroyers to accomplish His objectives during the Apocalypse- defeating His enemies. In Revelation we find that evil spirits, released from the Euphrates, gather the armies of the earth to battle and kill each other at Armageddon, yet other passage assert that God will gather them. Moreover, we should allow room for more than one interpretation and fulfillment of God accomplishing His deliverance. The passage suggest that an Islamic mosque, perhaps the Dome of the Rock, will be cast down just prior to the rebuilding of the Altar of Sacrifice for the Temple of God. Of course, the destruction of Baal’s altar may symbolize the Kaaba or another important Islamic structure. Further, the passage suggests that a Catholic Cathedral or building will be cut down at the same time, and it may point to the Temple Mount being strategically taken by the servants of God and fortified to prevent a backlash. The ten men who helped Judge Gideon point us to the tenth day for Israel in the Moedim Paradigm, but they may also represent ten powers on Earth, possibly even the ten-nation-league of the Beast (Dan. 7:7-24). And, of course, there will be those who serve Christ who are willing to help the Jews accomplish God’s objectives (see Zech. 8:23). Readers should choose what they consider the most likely fulfillment of the ten men. My opinion is that God keeps certain things secretive until the appointed time of their fulfillment. In the next and last article on Gideon, God willing, we will finish the foreshadowing story of Israel’s deliverance with more messianic symbolism and apocalyptic parallels.